You should not be surprised to know that 95 to 97 percent of Network Marketers fail because they lack the tools, training, and marketing system to build their network marketing business. Believe it or not, it’s not their fault. You see the internet has drastically changed the way network marketers do business and if your company is not keeping up with those changes, they are setting you up for failure. Do you have the tools, training, and marketing system to build your network marketing business? If you’re like most entrepreneurs that are new to the Network Marketing Industry, chances are you’re struggling to build you business. If you’re like me and thousands of others that have come before you, you have probably been told to make a list of your family and friends so that your sponsor and you can contact the people on your list. If you’re like most entrepreneurs, chances are this is probably not the first time you have been told to make a list and this is probably not the first time that you have approached your family and friends with a business opportunity. If that technique did not work the first time you tried it, don’t you think it’s time to try something different? The reason it didn’t work the first time is because your family and friends did not ask you about your business opportunity, you pitched them your business opportunity, and chances are they told you they were not interested or something else polite to not hurt your feelings. It also did not work because your family and friends were not qualified prospects. Qualified prospect are people that are looking for what you have to offer; qualified prospects are more like to buy your product or service because they are actively looking for what you have to offer. Would you like to learn how to generate an endless stream of qualified prospects? Would you like to be able to teach your team members how to generate an endless stream of qualified prospects? 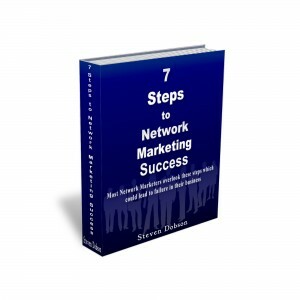 Would you like to have access to a Marketing System that will teach you all the skills and strategies you need to know to build a successful Network Marketing Business? If you answered yes to those questions, you’re like every Network Marketer that has come into this industry with hopes of building a successful business either to supplement their current income or to replace their current income. Some have done so successful, but many have joined that 95 to 97 percent that have failed. I want you to be a member of the 3 to 5 percent that have succeeded because knowing how to build your network marketing business is what will separate you from those that have failed. I also want to help you cut years off your learning curve and save you thousands of dollars in your hard earned money by introducing you to a simple marketing system that has taught thousands of network marketers around the world the skills and strategies they needed to build a successful network marketing business. Do you have the tools, training, and marketing system to build your network marketing business? Most important, do you want the tools, training, and marketing system to build a successful network marketing business. Our goal is to help you start earning an income in your network marketing business and to teach you the necessary skills and strategies that you need. If you’re serious about building a successful network marketing business, click on one of the links above and watch the video to learn how you can get the tools, training, and marketing system to build your network marketing business.